It's likely a listener might have one of two reactions to Amoral's fifth release Beneath. One, clever, this band is versatile and progressive. Or, two, these guys are all over the place, lacking both direction and substance. Perhaps, and better, the answer is somewhere in between, or defined by the song. Amoral forged a more melodic path, abandoning their death metal roots and adding clean vocalist Ari Koivunen, with 2009's Show Your Colors, and found some success (and critical acclaim in some parts, including from Dangerdog). Essentially, that melodic path remains well intact: most songs here blur the line between melodic hard rock and heavy metal. Most notable are Closure, Same Difference, and This Ever Ending Game. Amoral tries to deliver some accessibility with the quick pace and catchy hooks of Wrapped in Barbwire or Hour of Simplicity. Then, within this same melodic motif, there are disappointments like Silhouette and Things Left Unsaid. But there's also the quirky moment with (Won't Go) Home, where Amoral returns to melodic death metal. Is that Koivunen growling? Ouch. Sandwiched in between all this are two numbers, Beneath and Of Silent Stares & Fire Lost, which can only be described as melodic progressive metal. Of the two, the former is the most interesting and persuasive. But, frankly, this is the best stuff here, and displays Amoral in the best light. More of this in the future would be appreciated. Overall, excepting these two songs, Amoral's Beneath is largely uneven and only mildly interesting. 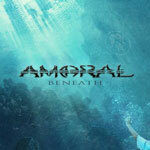 Excepting the opening and closing songs, Amoral's Beneath is largely uneven, only mildly interesting, and so, not necessarily that persuasive.